Obi here, filling in for Mom. 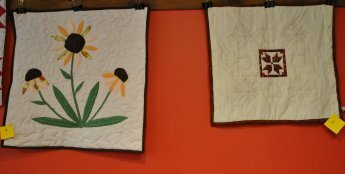 All of our Fabric Challenge Project Entries are in and hung on the wall with tender care. 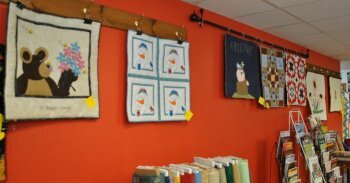 We invite all of you to come in, check out the beautiful entries and vote for your favorite wall hanging. Voting is from December 8-14th. Winners are determined by you, our customers. We have a record 7 entries this time around. They are absolutely beautiful! I'm sure glad I don't have to pick the Winner because I don't think I could. A reminder on how our Fabric Challenge works. Each entrant was given 2 random pieces of fabric, each piece being roughly 3" x 6" or so. 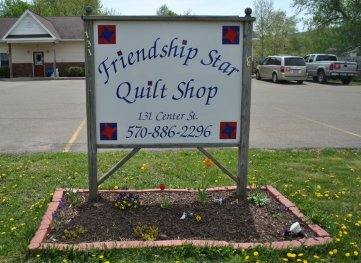 The 2 pieces of fabric have to be in the quilt and the contestant can add up to 4 other fabrics to complete the wall hanging. The wall hanging can be of any design, imagination is the only limit. Here are some photos of the entries. Mind you, the photos don't even come close to doing the wall hangings any justice. 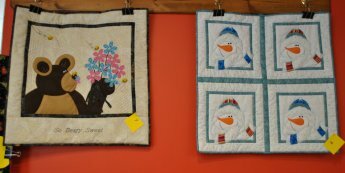 Please stop in, enjoy the quilts and vote for your favorite wall hanging. One vote per day, only. The ladies have out done themselves on this Fabric Challenge! Thank you to all of the ladies that entered our Fabric Challenge! All of you did a fabulous job on creating these beautiful works of art. Have a wonderful, tail wagging week and we hope to see all of you this week to vote on our Fabric Challenge Projects. oh yeah....Maryanne & Mary Lou, too.